The freshwater Lake Vostok is about 160 miles long by 30 miles wide, and has an average depth of 1,417 feet, making it one of the largest twenty lakes in the world by size, depth, and volume. (Within the top 5 by depth and volume). It also just so happens to be buried beneath 13,100 feet of the East Antarctic Ice Sheet. It’s named after Vostok Station (itself named after the Russian vessel that discovered Antarctica), which directly overhead it at the Southern Pole of Cold, the coldest place on Earth. 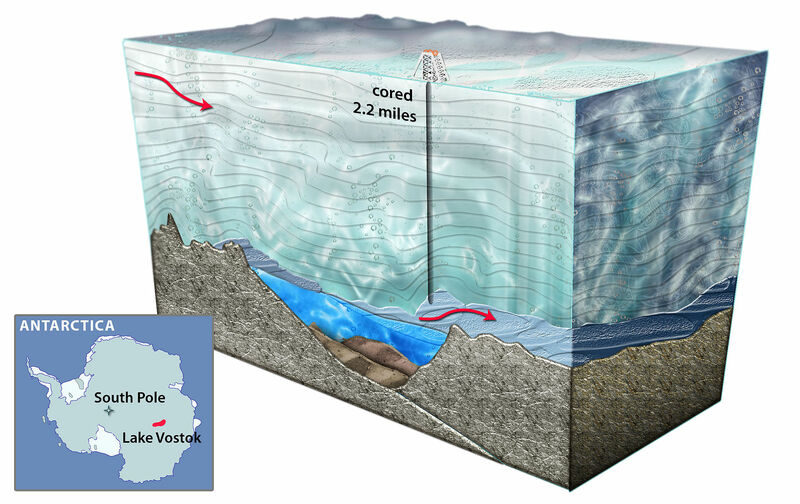 Due to its location underneath a the ice sheet, the “surface” of Lake Vostok is actually 1,600 feet below sea level. It’s the largest subglacial lake on the continent, of which there are almost 400 known to exist. Nearby lies the Gamburtsev Mountain Range, which is entirely subglacial, and about the size of the Alps. In 2005, an “island” was discovered in the central part of the lake. Its exact size and morphology are uncertain. Posted in Science and tagged Antarctica, drilling, Enceladus, Europa, glacier, ice, Lake Vostok, Science on October 1, 2017 by mountainwashere.